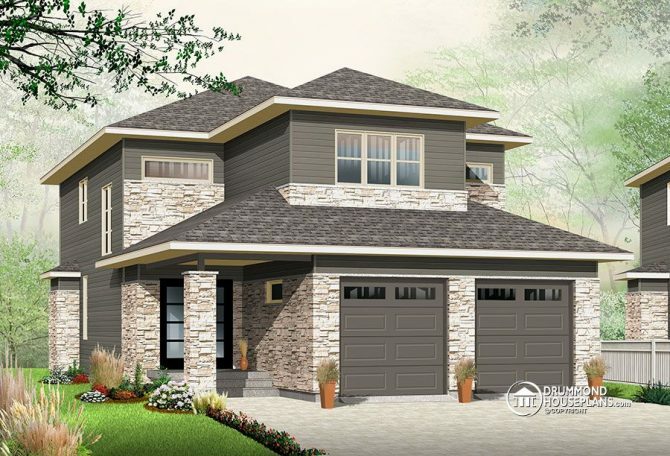 As practical as it is elegant, this surprising 2 storey narrow lot house plan with Contemporary inspiration and nursery off the master suite is full of delightful features that are sure to please! From the well thought out design, that maximizes space in its open floor plan, the entrance foyer offers not only abundant closet space but has a powder room tucked conveniently to one side. The second floor has a large master suite complete with double vanity and access through the walk-in closet to a home office space that could be used as a spare bedroom because it is also accessible through the laundry room on this level. A walk-in linen closet and two secondary bedrooms that share a full bathroom complete the wonderful features of this surprising 2 storey with Contemporary inspiration and nursery off the master suite. ← Previous Post: 4 bedroom Traditional house plan with Rustic touches & two master suites!